AllTheTopBananas (ATTB) Ltd is proud to announce a new and exciting website built for FE Careers is now live. In what has been a complex and ground breaking project, ATTB has worked with FE Careers (www.fecareers.co.uk) to bring fresh innovation to the market. While a traditional job board model of job and CV credits is retained, a hybrid advertising model pushes the boundaries. This is a blend of job credits and job aggregator spend, to save time and allow clients access to a wider talent pool. The new platform expands on the foundation of a single dashboard offering greater access and functionality for job seekers and clients. Clients can now source candidates in both the Further Education and Apprenticeship (www.fecareers.co.uk/apprenticeships) market. 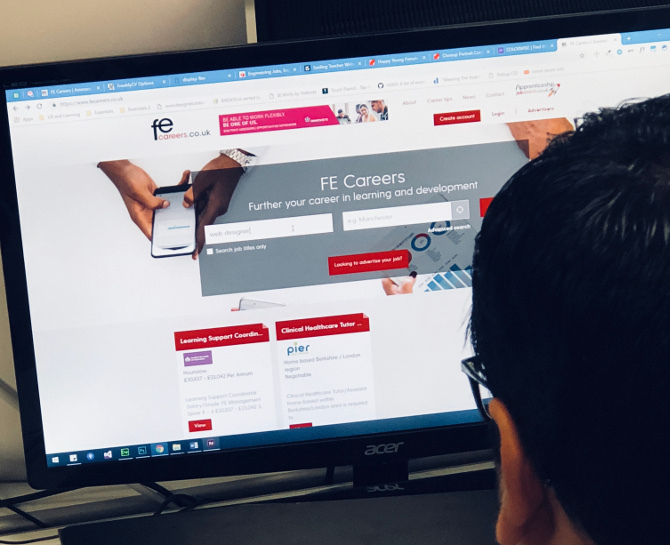 ATTB also developed one interface for premium clients of FE Careers to recruit their staff, attract learners, and utilise cutting edge AI technology to manage external job advertising budgets on multiple sites; all through one FE Careers portal. Commercial Director at ATTB Ltd Cris Bradshaw said: “We’re really delighted to have worked with FE Careers. With our technical expertise and vast experience in the recruitment industry, we have achieved an excellent product for the client and one which we’re really proud of”. CEO and Head of Digital of FE Careers and FE News Gavin O’Meara said: “We have worked with ATTB and as a result have a product we’re excited to offer our clients. It has been technically challenging but made easier working with ATTB as they’ve understood our aims and ambitions and have brought them all to life”.